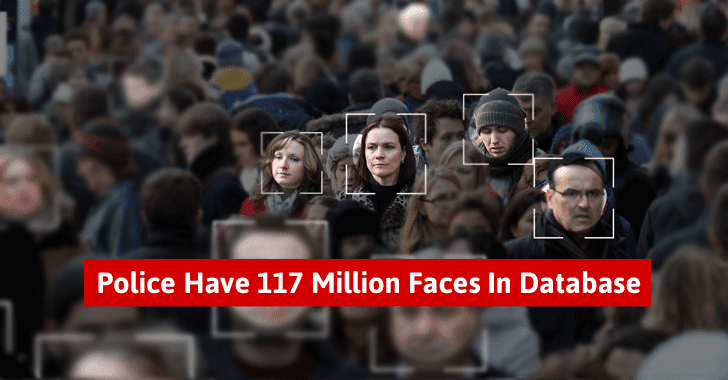 With the help of state driver’s license data, U.S. law enforcement agencies have created a huge a face-recognition database of more than 117 Million American adults that are regularly scanned in the course of police investigations. What’s even worse? Most of those people who are scanned by police without prior knowledge are law-abiding citizens. According to a 150-page study published Tuesday by the Center for Privacy & Technology at the Georgetown University, ID photographs of more than 117 Million adult US citizens — that’s about half of the US population — are now part of the "Perpetual Line-up," which can be searched using facial-recognition software. In the past few years, Facial Recognition technology has improved enormously. Even big technology companies like Facebook have developed so powerful facial recognition software that they can even identify you in photos even when your faces are hidden. So, why would law enforcement be left behind? Currently, at least 26 states reportedly allow their law enforcement agencies to run face recognition searches against their driver’s license databases, while dozens of local law enforcement agencies are using commercial software to scan images captured by ATM cameras and other surveillance devices. This clearly indicates that millions of law-abiding American citizens are potentially being pulled into the dragnet, raising legal and privacy concerns about the use of this facial recognition software, the report explains. The report calls the use of facial recognition system "highly problematic" because of its potential to identify and monitor innocent citizens. Police departments usually keep fingerprint and DNA databases, but that are typically collected from criminals or people who have been arrested, not the common public. "Innocent people don’t belong in criminal databases," said Alvaro Bedoya, the co-author of the report. "By using face recognition to scan the faces on 26 states’ driver’s license and ID photos, police and the FBI have basically enrolled half of all adults in a massive virtual line-up. This has never been done for fingerprints or DNA. It’s uncharted and frankly dangerous territory." Another area of concern is that out of 52 agencies that use or have used face recognition, only one — Ohio’s Bureau of Criminal Investigation — has a policy in place to prevent its officers from using the software to track religious, political or other free speech activities. Accuracy is also a strong concern because facial recognition is far from perfect, as just one leading provider of face scanning tools says its reliability rating is only 95 percent. Meanwhile, the facial-recognition technology is reportedly less accurate when used to identify black people, women and those aged 18 to 30. "An accurate algorithm correctly identifies a face in an ATM photo and leads police to a robber’s door," the report suggests. "An inaccurate algorithm sends them to the wrong house — and could send an innocent person to jail." The report also describes how the facial recognition technology is spreading rapidly and is almost entirely unregulated. The findings argue the First Amendment is meant to protect "our right to express ourselves anonymously," and warn that police use of face recognition "to continuously identify anyone on the street—without individualized suspicion—could chill our basic freedoms of expression and association, particularly when face recognition is used at political protests." In response to this report, over 50 civil liberties groups, including the American Civil Liberties Union (ACLU), delivered a letter to the Department of Justice’s Civil Rights Division Tuesday asking it to investigate the expanding use of face recognition technology around the country by police. Using facial recognition technology, "Police are free to identify and potentially track anyone even if they have no evidence that that person has done anything wrong," says ACLU’s legislative counsel Neema Singh Guliani. "We do not expect that the police can identify us when we’re walking into a mosque, attending an AA meeting, or when we are seeking help at a domestic violence shelter." The unsupervised use of face recognition systems on a regular basis threatens the privacy and civil liberties of Millions, especially immigrants and people of color, according to the dozens of signatories. For in-depth information, you can head on to the report [PDF], titled "The Perpetual Line-up: Unregulated Police Face Recognition in America."